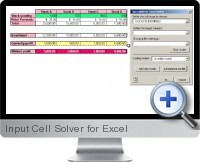 Input Cell Solver is an Excel add-in which allows the backward calculation of input cells setting the desired result for a range of dependent formula cells by changing a specific input cell or range of the input cells automatically. The Input Cell Solver Excel add-in allows target seek solutions to many spreadsheet cells at one time by configuring the seek target wizard and does multiple re-calculations automatically. Multiple Seek target Wizard - input cell or range to change, define target values, and the cell or range to be changed. Breakeven analysis - define the cell or range to change, and the changing cell or range. Administrate Models - Create saved relations within analytical models to monitor changing cells or ranges with corresponding outcomes. Create toolbar with the saved models - add the administrative models to a custom toolbar for quick access within Excel. Toggle Settings - globally set view settings within Excel and toggle between them.